The latest in the Make Toys Remastered Series - Cupola! Figure stands approximately 23CM/9 inches tall. "Re:master " , in a time where scale is everything.....Re:master is a new series to bring a new twist, new gimmicks, and maybe even a new scale to the world of transforming robots. An instant classic to an already bright and vibrant world of robots, we hope Re:master will have a place in everyone's hearts......and on their shelves! 1.downside for me: Comes packaged in robot mode. I know that is a very nitpicky thing. I prefer them to arrive in vehicle, probably a holdover from childhood. But an incredibly solid figure, great heft with those glorious ratcheting joints where it counts, looks good and dynamic from every angle with metal knees and a metal core/tech spec plate forming the center (metal part also comprises the dashboard/steering wheel. sorry, the headmaster-activated techspec gimmick is not here, it is a painted on spec of what the original read, hardly worth mentioning really). A little fiddly with the transformation; if you follow the diagrams it will be fine. One of the tributes where I can put him toe to toe with the original inspiration figure and see such clear upgraded parallels in the sculpt, paint app, plastic, etc. Love the scale. 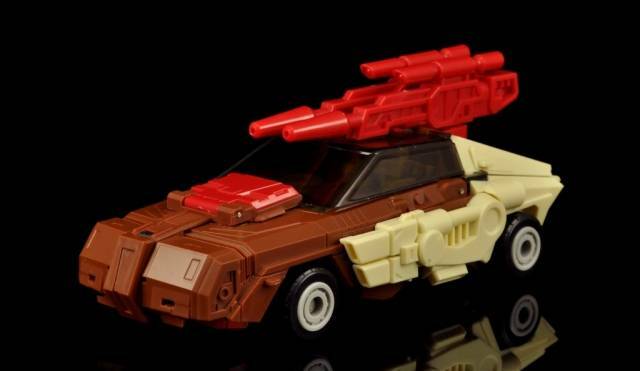 Light on extraneous suprise gimmicks, but a well built, perfect Chromedome tribute Rolls well in car mode which is slick and powerful, but slightly station wagon-esque with that brown color scheme. 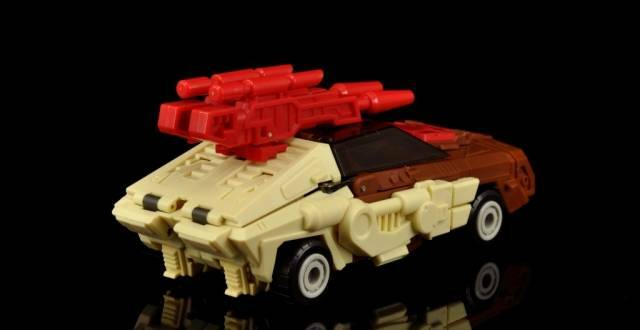 Weapons transform slightly with the peg to attach them in vehicle mode swinging in to reveal the grip for robot mode. I understand there is a Hardhead tribute coming up next? with Real tank treads? Please keep em coming with the RE:masters,Maketoys! "HEAD ON! dun du-du dun HEAD ON!" And what a master he is, masterpiece that is. I cannot say enough good things about Maketoys Cupola but I will try to keep it simple and straight to the facts. BEST MAKETOYS PRODUCT EVER! They have really upped their game on this one, both in terms of quality and in design. So much so that you would swear this was an official Takara product. Awesome Bot mode, equally great Alt mode, rubber tires, gold chrome wheels, diecast in all the right places. I would actually go as far as saying that Cupola is on par (if not better) than MP Ultra Magnus' quality. It just has that much appeal to it. The only Cons I can think of are personal preferences: The "Stylor" headmaster is stubby and the arms are a little goofy looking. And I will never like ball joints on a figure that small, not from any company. Just straight pin them so they can swivel and call it a day. I would also have liked to see more paint apps on the weapons, but that's a minor nitpick since they look great as is. The only QC issue is merely advice: when turning the legs grab them by the hips to avoid stress at the thigh ratchet. Again I cannot recommend Maketoys Cupola enough, both to Chromdome fans and avid Transformers collectors alike. If you are on the fence about it, don't be! This is one purchase you won't regret. And if you do I will happily buy it from you, its just that good. 6 stars if I could. Its in a class of its own. After playing with this I have cancelled all my preorders of other transformers around the $100 mark. They are just not worth that amount anymore. Not with this around. Also looking at all my other transformers of around $100 mark from TFSource I now feel like I've paid too much for them. It truly has redefined my benchmark. "Not exactly an Amica Endura... but VERY nice"
The Good - There is so much to love about this figure that I almost reconsidered the star rating. Make Toys's version of not-Chromedome is a thing of beauty in robot mode. He looks great standing next to my other 3rd party Headmasters ; I can even swap the head with my Toy World Brainwave (not Brainstorm). He also looks great standing next to other Masterpiece figures. 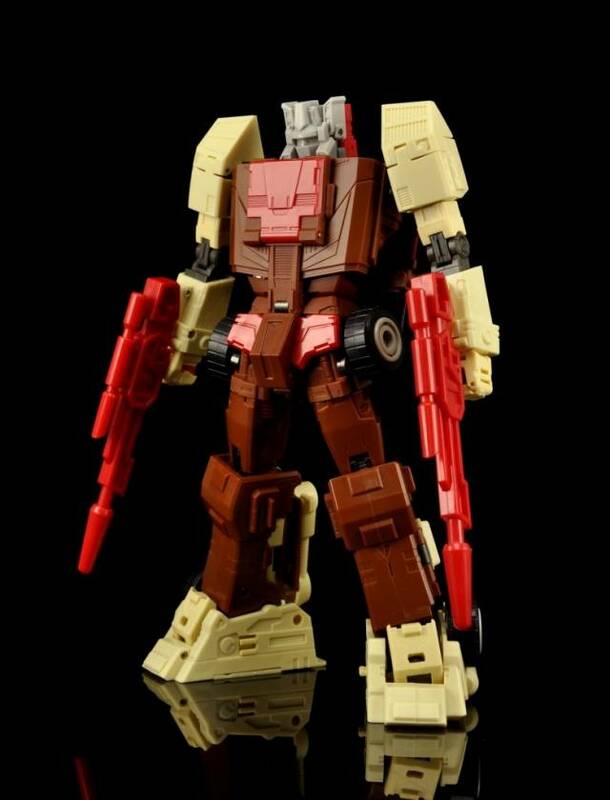 Before he came in, I was worried that the brown, tan, and red color scheme would appear dull. I was wrong, and there are enough little paint apps to break things up nicely. He poses well too. Most of his joints are strong and tight, and the slotting of the guns in to his hands is easy and sturdy. Make Toys did a first rate job on this figure's robot mode. The Bad - while nice joints are helpful in robot mode, the tightness can make some steps of transformation difficult. On mine at least the hips and knees are too tight while the ankles are a bit too loose. Price also might be an issue; it's a hair steep. Although you get a lot of toy for that price, I bought mine only as a result of an unexpected windfall. The Ugly - the transformation on this guy is beyond rough. 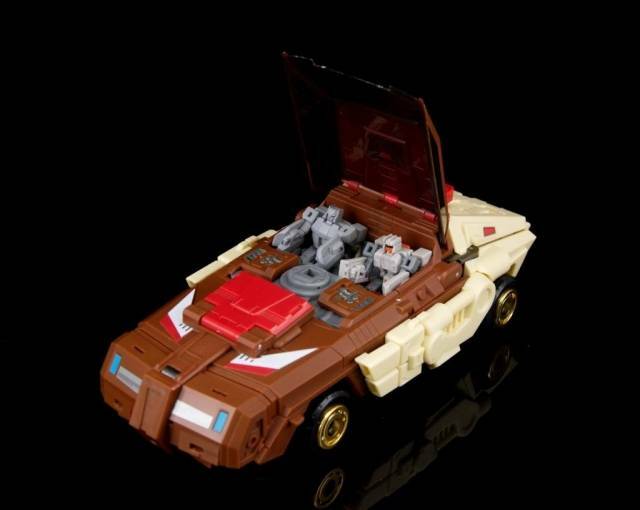 Both modes do an excellent job of hiding it, but Cupola has a ton of kibble to be tabbed. Everything has to be positioned just right at every step so that he has clean lines in either mode. I had to go back several steps at two different points in the transformation from robot to alt mode because tabs and slots didn't meet EXACTLY right. As tf fans of every sort know, directions are never as clear as they could be, and this is usually doubly true with the 3rd party figs. This adds to the frustration of the multiple small tabs and slots. 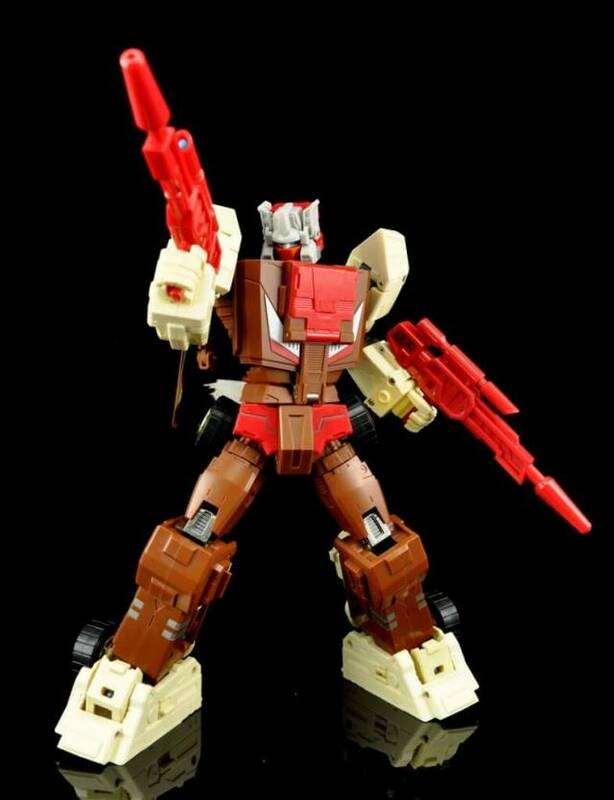 Overall, Make Toys has given us THE Chromedome figure. I avoided the Function X - 1 because it looked small and slightly off, but Cupola fits the animation models nicely. For all of it's beauty in either mode, a word of warning is necessary. Unless you're a masochist or aligning the slots and tabs on kibble is your fetish, keep this guy in robot mode.